If you want to see the Gorillas, the best spots to see Gorillas are Rwanda, Uganda, and Democratic Republic of Congo. Currently, there is some unrest in the Democratic Republic of Congo making Rwanda and Uganda the focus of this post. 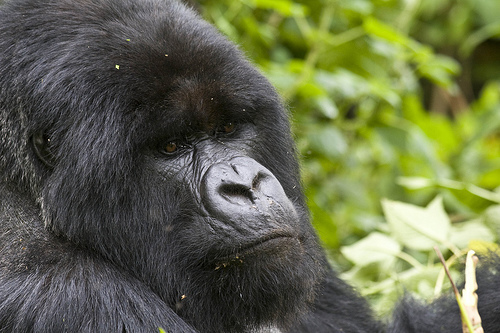 There are 790 mountain gorillas in the world. Where are the Gorillas and Chimpanzees located in Uganda and Rwanda? The following information below summarizes where travelers can find Gorillas and Chimpanzee in Uganda and Rwanda. The Virunga mountains are composed of three different parks: Parc National des Volcans (120 km2), Mgahinga National Park (33km2) and Virunga National Park (7,800 km2), which is located in the Congo. Of the 790 mountain gorillas left in the world, 380 are located in the Virunga mountains. Another half of the gorillas live in Bwindi National Forest. When should I visit Uganda and/or Rwanda? You can visit any time of year, but there is a short wet season from March to April and October to November. How much do permits cost in Uganda (Bwindi/Mgahinga) and Rwanda(Parc des Volcanoes)? Should I visit Uganda and/or Rwanda? The main attraction is Parc National des Volcans (PNV). The advantage of PNV relative to the parks in Uganda is that the Gorillas are lot easier to see. Within only an hour or two, you will see the Gorillas. The forest is also a lot less dense because of the volcanic area making it easier to great pictures. From my research, everyone raves about the experience of seeing the Gorillas. You don’t hear a lot of people talking about hiking up the volcano or visiting Lake Kivu. I think if people are looking to spend more time in the area that they spend that time in Uganda. Most people visit Bwindi Impenetrable Forest and/or Mgahinga National park: Of the two, it appears that Bwindi is the more popular of the two parks. From my research, it is a bit of hike to travel to the Gorillas in Bwindi National Park. It is much easier to visit the Gorillas in Rwanda. If you are not up for a 2 to 8 hour hike in the dense forest, it might be best to see the Gorillas in Rwanda. Since Murchison Falls National Park is the most removed from the other parks, it is often excluded in shorter Uganda trips. These above options are often utilized when a tour company offers back to back Gorilla treks, and some individuals might want to skip going on the Gorilla trek to save money on the permits or are not interested in seeing more Gorillas. How do the cost of tours vary? The cost of permits adds considerably to all of the tour costs. There is also variation in the quality of the lodging from budget to moderate to luxury. 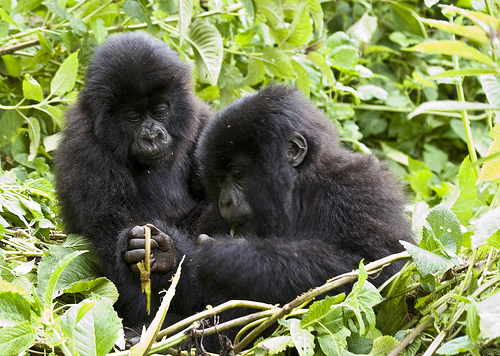 Diversity of tours in Rwanda is more limited than in Uganda as there are fewer national parks to view. While I don’t know if I need to see Gorillas in 2 days in 2 separate locations, I would definitely like to visit both Rwanda and Uganda. I would like to do a Gorilla Trek and see Chimpanzee. I would most likely to join this trip to Kenya and/or Tanzania for one epic East Africa trip.